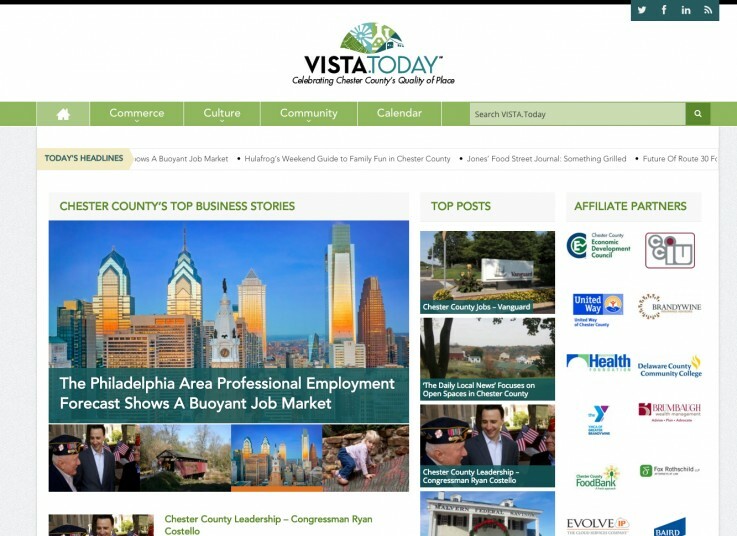 VISTA.Today, a growing daily news site for Chester County’s top business stories, approached MDW to redesign their website as well as define and build out their brand identity. Their news stories are brief summaries, so I redesigned their site with a light, clean feel that brings the focus on easy to read concise stories for their target audience. This also included redesigned bi-daily emails to include their affiliate partners and showcase their stores in a clean and consistent manner. More recently I converted their now 5 publications to WordPress Multisite to make development work in the future and their daily site management more efficient. I also combined the 5 historical git repos while preserving commit history, which was anything but a simple task. We continue to work with them on the expansion of their brand and county/local specific offerings.